Congratulations on your upcoming wedding! JULIAN STATION offers an affordable and unique location for your special day. Imagine having your wedding ceremony overlooking open golden pastures with large oak trees and a view of the magnificent Volcan Mountain Range. Then, while you and your beloved catch your breath (and take photos) your guests can fan out among the four on site tasting rooms at JULIAN STATION and sample the Julian area's finest Wine, Hard Cider, Mead and local Micro Brews while browsing unique shops. After that, everyone gathers on our covered outdoor patio with the same beautiful views for the wedding toast and an unforgettable reception dinner followed by twilight dancing. Sound fun? Read on for more details to help you decide if JULIAN STATION is the right place for your wedding. JULIAN STATION offers many options for your wedding day including INDOOR weddings on weekdays for the cooler months of the year and outdoor weddings for parties of up to approximately 150 people. We have two basic wedding packages: A Do It Yourself Wedding and a Full Service Wedding Coordination Package. *This price is a venue fee for a wedding you coordinate and decorate, etc. yourself (which people often love to do). Tables and chairs for small weddings (approximately 45 people are available free of charge). 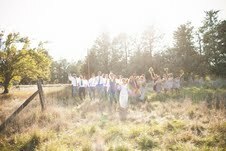 For larger weddings, the wedding couple would be responsible for everything, including supplying your own chairs in the open field or under the oaks for the ceremony portion of the wedding. Catering is provided by Mr. Manitas, our onsite restaurant which features grass fed beef, organic chicken, local pastured pork and seasonal organic produce. Plates start at $16 per person. A catering menu is provided with your site visit or by emailing Cara Marino at cmarino.gonzalez@gmail.com. -Day/Week of Wedding Coordinating Package** (see below for what this includes): Perfect for a bride who has her own ideas but needs some professional assistance and guidance along the way.  Accept Deliveries: Cake, Flowers, Etc. 1. In house caterering only. In house alcohol only. 2. All events must begin no earlier than 4:00 pm (setup begins at 3:00) with music ending by 9:00 pm. sharp and a maximum of 10:00 for the close of the event. Cleanup is allowed as late as needed as long as noise level is minimal. 3. Equipment not included: Audio, Linens, Tables, Chairs, etc. 4. $700 security deposit due upon agreement. 5. Total payment due 30 days prior to event. One thing that was great about this place (and that allowed us to plan it in a short timeframe without losing our minds) was that food, alcohol and rentals are all in house so no extra vendors to deal with. Also the view from wedding venues was amazing! We had our wedding here and couldn’t have asked for anything more than what we got with the chef and staff. The food was amazing and my family is still raving about how great it was. The staff at chicago wedding venues was so on top of everything. responsive wordpress theme It proved to be Very helpful to me and I am sure to all the commentators here! Picking the correct Wedding Lingerie is as critical as the choice of your wedding dress, you need your big day to be genuinely vital, so don't hold back on your Wedding Lingerie. Very good article about wedding with amazing photos. Thank you so much for share your informative and enjoyable article. Great Article learned many things about wedding planners from this blog, very informative. The theme wedding in Chennai is one of the best places to book wedding planners in Chennai.